Diwali, one of the most important festivals of the year, is marked by lighting up the houses, exchanging gifts and feasting on traditional dishes. This is also the time of the year when many of us plan the best get-togethers for our close friends and family. Deciding the Diwali party food menu that appeals to all the guests is a difficult task. With desserts being an integral part of the festival, guests look forward to munching some spicy and different. So, this Diwali why not ditch the same old readymade desserts and surprise your guests with homemade Diwali special snacks? Thanks to the smart kitchen appliances from KENT, making some of the traditional snacks for Diwali is no longer a hassle. So, in this blog, we list 5 dishes for Diwali that are tasty and easy to make with KENT’s smart chef appliances. Any get-together is incomplete without a plateful of crispily fried samosas. However, this Diwali, instead of ordering readymade samosas, why not surprise your guests with freshly-made homemade samosas? Many of us would cancel the idea immediately as it needs a lot of efforts and time to prepare the dish from scratch. To your surprise, KENT Atta and Bread Kneader preparing the dough is no longer a hassle. All you need to do is add the required ingredients in the appliance, and the dough will be ready in minutes. You can also mix some vegetables in the dough to give a healthy twist to the dish. Hara masala kebabs have the perfect assortment of health and taste, hara kebabs can be easily made at home using the smart chef appliances. All you need to do is add healthy green vegetables such as spinach, green peas, coriander and potatoes in the KENT Turbo Grinder and Blender to get a smooth mix. To give a healthy twist to the dish, you can use the Pizza and Omelette Maker from KENT to prepare oil-free kebabs. 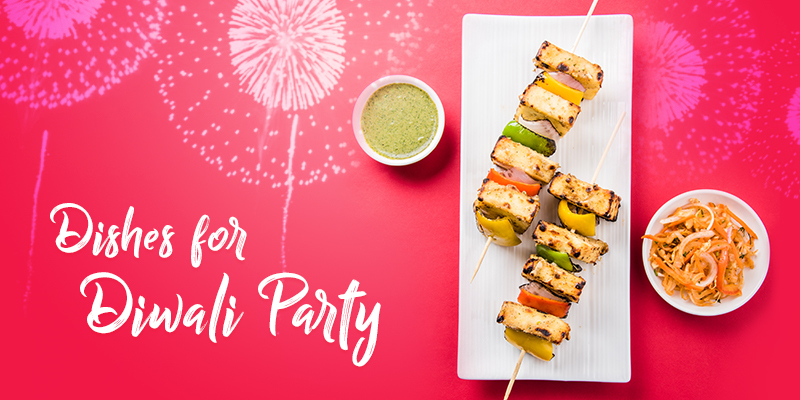 A crowd pleaser, paneer tikka is a very easy and healthy recipe that you can include in the menu of your Diwali party. When prepared the right way, your guests will love the perfectly soft and flavourful snack with a smoky taste. Marinade the pieces of paneer and bake them using the KENT Sandwich Grill. Your restaurant style smoky paneer tikka will be ready within minutes. You can also prepare your choice of chutneys to accompany the paneer tikkas using the 3 in 1 Mini Blender and Food Chopper. A famous street food of Rajasthan, Mirchi Vada is a spicy snack that you can add in the menu this Diwali. Stuffed with a spicy filling, Rajasthani Mirchi Vada will be a welcome change for people tired of eating desserts throughout the day. The smart chef appliances from KENT make it easy to prepare the snack from scratch. You can easily fry the mirchi vadas using the KENT Fryer and Curry Cooker which is an ideal appliance for preparing deep fried snacks safely. Instead of serving the same old sweetened drinks, this Diwali you can include some healthy shakes in your diet. One of the delicious smoothies that you can make this Diwali is Chocolate hazelnut milkshake. A creamy mixture of chocolate, hazelnut and cocoa powder, chocolate hazelnut milkshake will be very different from the monotonous Diwali drinks that you serve every year. You can easily prepare the creamy milkshake using KENT Digital Power Blender and Grinder. So, What Will you Prepare this Diwali? So, this Diwali, skip the same old readymade Diwali special foods that you order every year and prepare these mouth-watering snacks using KENT smart kitchen appliances. These appliances not only make it easy to prepare different types of dishes but also ensure that you prepare something healthy and fresh. Browse our website to check out the range of kitchen appliances.